Garlic is portrayed as Wario's favorite food, appearing as recurring item in the Wario Land and WarioWare series. It often functions as a beneficial item that heals Wario or confers him strength. In effect, Wario is said to eat whole cloves of garlic constantly, making him smelly as a result. In Wario Land: Super Mario Land 3, a type of garlic power-up called the Garlic Pot appears. It turns Small Wario into normal Wario, and normal Wario into Bull Wario. It returns in Virtual Boy Wario Land as the garlic bottle. In Wario Land 3, garlic is one of the treasures that Wario has to collect. Once found in the Tower of Revival, after Wario opens the Blue Snake door, it will confer him the ability to break solid blocks. Also in Wario Land 3, several heads of garlic can be seen hanging from some platforms in Forest of Fear; if Wario transforms into a vampire and touches a garlic head, he instantly reverts to his regular form. In the pre-release versions of Wario Land 4, the Heart Gauge was shorter and had a garlic icon next to it, implying that Wario originally had to collect garlic rather than little hearts to recover his Heart Meter. Shaking an enemy in Wario Land: Shake It! will occasionally cause it to drop a head of garlic, which will start bouncing on the ground until collected. Garlic heals one heart of Wario's life meter. Some enemies release a bigger type of garlic, which restores three hearts of Wario's life meter. In Wario World, garlic heals Wario, and Garlic Dispensers vend heads of it to him in exchange for coins. They are also sometimes found in wooden chests. The "Nasty Garlic" from WarioWare: Touched! In WarioWare: Touched!, Wario eats a "Nasty Garlic" in Wario-Man's intro cutscene and transforms into Wario-Man. After the microgames are beaten for the first time, it will then appear on the main selection screen so that Wario can turn back into Wario-Man at any time. In Wario: Master of Disguise, garlic is one of the five kinds of falling objects that appear in the minigame Trash It. When garlic appears, it must be dropped into the mouth to score. Garlic also appears as one of the possible images shown during Trick Slider and one of the shapes the blue dot needs to be traced through in Zappy Path. 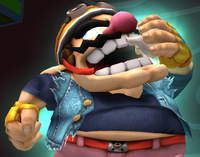 In Super Smash Bros. Brawl and Super Smash Bros. for Nintendo 3DS / Wii U, Wario eats a head of garlic (called "Nasty Garlic" in the English version) to transform into Wario-Man for his Final Smash. An enormous head of garlic can be seen lying on a table-like platform at the right side of the Wario Board in Mario Party 10. It only fulfills ornamental purposes. In Mario Tennis Aces, Wario is seen eating a head of garlic to strengthen himself as part of his Special Shot called the Glorious Garlic Bomber. This page was last edited on April 24, 2019, at 11:53.